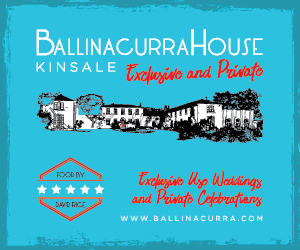 Restauranteurs in Kinsale are busy preparing for a weekend of food and fun as the annual Gourmet Festival takes place this weekend. The ever-popular festival has been sold out since August with the much coveted festival tickets attracting food enthusiasts from all over the world into Kinsale to experience a culinary feast featuring the best of local produce from Kinsale and West Cork, prepared by chefs from the member restaurants of the Kinsale Good Food Circle with special guests this year from Kinsale’s sister city, Newport in Rhode Island. Comedian Barry Murphy will MC the Mad Hatter’s Taste of Kinsale event sponsored by Musgrave’s Market Place on Saturday which starts with Christy’s Champagne Reception. Guests will enjoy a truly wonderful food trail led by Alice, the Mad Hatter, the March Hare and the Field Mouse. This really is a magicalfoodie walking tour around the town sampling gourmet delights as guests move from location to the next location showing off their colourful headwear while enjoying the amazing creations by a team of chefs from Kinsale and Newport, Rhode Island. Prizes are awarded for the best hats from Kinsale’s own award winning and world renowned hat boutique and milliner, Hattitude. Guests will enjoy an aperitif at The While Lady Hotel on Saturday evening while enjoying music from DJ Anthony Collins of Glastonbury fame and Jazz Diva Sharon Crosbie at the Blue Haven Hotel. The Gourmet Festival continues on Sunday with the Clona and Pallas Foods Sponsored Seafood Spectacular at Actons Hotel. 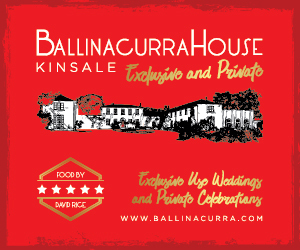 Guests will enjoy a Blacks Gin and Champagne reception followed by a Seafood Fest prepared jointly as one team by the chefs of the Kinsale Good Food Circle Restaurants. Comedian Barry Murphy will entertain followed by the amazing Pat Fitz Band of The Voice fame. 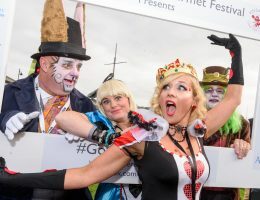 This year’s festival promises to be extra special with the arrival of 50 visitors from Kinsale sister city Newport, Rhode Island who will be welcomed with a drinks reception hosted by Kinsale Chamber and Kinsale Good Food Circle on Thursday evening and finishing with a Civic Reception at Cork’s County Hall on Monday. Let the foodie fun begin. Participating restaurants at this year’s Festival are The White House, Finns Table, Fishy Fishy, Jim Edwards, Man Friday, The Trident Hotel, The Bulman, Acton’s Hotel, The Supper Club and The White Lady.